Helen Reddy, the Grammy Award-winning artist, roared with “can do” optimism. Now, as a woman retired from show business, she is roaring with wisdom – about life, about the planet we all share, and about ways we can cooperate and bring about peace and prosperity for all. Fully committed to her divine purpose as a spiritual teacher, she is committed to helping all of her sisters and brothers understand that each of us has an inner strength and an inner guide to help us overcome any obstacle in our way. A student of metaphysics for five decades, Helen has moved out of the entertainment spotlight to take an active role on life’s stage, as a clinical hypnotherapist in Sydney, Australia, helping clients find purpose and balance, and as a speaker who focuses on where we are now as spiritual beings as the planet undergoes a shift of unknown proportions. Helen Reddy, who inspired millions of people worldwide for more than 35 years as a vocalist and actress, delivered a message of strength and invincibility. She was the first Australian to win a Grammy Award and to have three #1 hits in the same year. In television, Helen was the first Australian to host her own one-hour weekly prime-time variety show on an American network, along with several specials that were seen in more than 40 countries. Helen was the first Western female performer invited to sing in the People’s Republic of China, and the lyrics she penned for her feminist anthem “I Am Woman” are now included in American high school textbooks. Her best-selling memoir The Woman I Am (Tarcher/Penguin) reveals the strong spiritual faith that has sustained her throughout all of the highs and lows of her life. 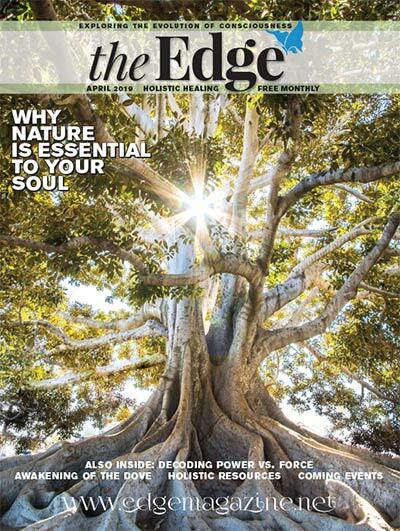 She spoke with The Edge from her home in Sydney about her upcoming visit to the Midwest, and much more. I understand you had an early experience at the age of 11 that changed how you viewed life and death. Can you relate what happened and how that affected you throughout your life? Helen Reddy: When I was 11, I was in school and we used to have assembly every morning, for the whole school. Teachers and pupils would assemble and there would be a hymn, and the head mistress would give a reading of some kind. There were chairs for the teachers, but not for us. We used to stand for the whole time. The head mistress was held up that morning by a phone call, so we were left standing for about 20 minutes before she came. During the middle of her talking, I started seeing brown spots in front of my eyes and was feeling just weird, and then the next thing I knew I was at the back of the room, looking down and I could see that one of the girls – we were all in identical uniforms – was on the floor. I thought, “Oh, somebody must have fainted. I wonder who it is?” And, I zoomed in for a close-up and I was looking at my own face. So, I thought at that point that I’d died, because I was definitely outside my body. That was the realization for me that I was not a human having a spiritual experience, I was a spirit having a human experience, that my body was simply something that I had been inside, you know, like a suit of clothes, but that the real me existed forever. So, since that time, even though I did not discuss it for many, many years, I have never been afraid of death or had any doubt of eternal life. At what point did you feel comfortable discussing it with other people? HR: Oh, not until many years later when people did start discussing experiences that they’d had – and most people will. Most people will say, “I don’t believe in this, that, or the other, but I did have this experience….” And then they will proceed to tell you about something that is definitely what I would call a psychic experience. Was spirituality a part of your upbringing? I was seeing a lot of hypocrisy. One week we’d be told that all the other religions were false, that ours was the only true one. And then the next week would be world brotherhood and our oneness with those of all faiths. It just wasn’t working for me. So, I became an atheist at the age of 9. Then, when I had the out-of-body experience at age 11, that was the really the rediscovery of something that I believed inside myself, but couldn’t prove, shall we say. What led to your interest in hypnotherapy? HR: Well, there was no such thing as hypnotherapy in those days. There were stage hypnotists, and because I was in show business, I was familiar with them. I always thought of them like magicians. The interesting thing is most of them didn’t believe in hypnotism themselves. I must have been in my early teens, I guess, when I read The Search for Bridey Murphy, by Morey Bernstein, which came out in the mid-’50s. It was a breakthrough kind of book, and my first awareness of reincarnation. That really set me off, and that was the beginning of my search. But hypnotherapy did not come into being until fairly recent times, and it is only now that we’re being validated by other branches of the mental health profession, shall we say. I’ve interviewed Michael Newton and I’ve read a couple books by him about the Life Between Lives (LBL). Have you had any experience with those types of experiences with clients in your hypnotherapy practice? HR: I have come across it, yes, although it’s not work that I specifically do. I’m very good friends with a couple of people who do practice LBL work. In fact one actually studied with Michael before he retired. What I am concentrating on most these days, with us being in the shift, is reuniting people with deceased loved ones who have passed over. It’s usually a parent or a grandparent that comes through, and they’re tremendously healing sessions, because these two people can now get together and sit down and talk. They are very emotional sessions and a lot of forgiveness and healing takes place. For me, anyway, that is what is most important at this juncture in our history. In a bigger sense, is it important for people to get past the fear of death? HR: This is a hard one for me to answer, because the fear of death is such a first chakra issue. There’s too much attachment to the body. The body is a temporary thing, but we are consciousness, and consciousness is energy. It can transform, it can come out in another form, but it can never be destroyed, so we have to be able to detach ourselves from the body. So many people think, “Well, that’s it. Once I die, I die and it’s over.” Actually, it’s just the beginning. During these transformational times, the shift, what do you see happening regarding money and personal finances? HR: I see the entire world monetary system collapsing. And, it is only when the rich find out that they cannot eat gold that it’s really going to hit them, I think. Do you think the ultimate solution for our economic chaos is more of a sharing of the wealth? HR: Well, I would redefine wealth. As the Bible says, “Love of money is the root of all evil,” and I really feel that we in America have worshipped money for far too long. We are starting to get back to the way a lot of things used to be, but there is far too much government interference in our lives – in every aspect. For instance, in the United States it is illegal to barter. That’s what I’ve been led to believe, because the government wants a piece of the action. The same thing has happened down here in Australia. For several years now they have had the GST, a goods and services tax. What that means is if you were a friend of mine and I was going to give you a haircut, and you were going to fix something for me, there would be an exchange of services. Even though no money changed hands, the government still expects to get tax on the money that they would have gotten if we had each paid for the services. This interference is unacceptable, as far as I’m concerned. I’m also very big on the fact that we have to start growing our own food as much as possible. We need to become much more self-sufficient. From a spiritual perspective, what advice do you have for people for these coming times during the shift? HR: I would just like to say what’s in your heart is going to have more value than what is in your purse. Are there any practices that you would recommend that we use in our daily lives, at this time? HR: More sharing, rather than trading. More giving freely without the expectation of something in return. Just a greater generosity of spirit. There was a story in Atlantic magazine a couple of years ago now. The journalist who wrote the piece had grown up in the Detroit area, and he hadn’t been there in years. He went back to visit his old neighborhood, and when he got there the entire block was gone, except for one house. Only one house was still left standing, and it belonged to the first black family to move into the neighborhood. The elderly woman was still there living with her grandson. One by one, as each of the other houses were vacated and the government had razed them, the land was considered to be worthless, so the city was selling it for a pittance. So this woman bought up all this land around her over a period of time. She now owns the entire block, and she’s farming it. There are something like 20 market gardens already going in the Detroit area, and I know people here in Sydney are growing vegetables on nature strips. There is a movement. It’s quiet, but it’s steady. I’m thrilled to see the way aquaponics is taking off [aquaponics: cultivation of plants and aquatic animals in a recirculating environment, with waste from freshwater fish supplying nutrients to the plants]. It’s something that I talk about a lot and I have no financial interest in it whatsoever. Hydroponics is water intensive. Agriculture is water intensive. With aquaponics, you have the same water recirculating, so you are using only 10 percent of the amount of water that you would use in normal agriculture. With so many areas now under drought, this is a Godsend. In the space of a single-car garage, I’m growing eggplant, green peppers, celery, and much more, and I get a harvest every four weeks. In aquaponics, you use freshwater fish. I’m using guppies that I got out of the duck pond down by the water mill, and that’s what I’m using. The color of the vegetables is incredible! I mean, to see an iceberg lettuce that’s a deep green color. The ones you get at the market you could read the newspaper through. And the flavor is wonderful, and its 100 percent organic. We cannot spray any of the plants because it would kill the fish. A lot of different sprays are used in hydroponics, so they can’t say that it is 100 percent organic. Even in the Twin Cities here, more people have begun growing their own food, not only to save money, but because of the pesticides and other harmful additives to store-bought food. HR: My daughter, who lives in California, has installed two huge water tanks and she has a half acre that she farms. She started planting an orchard 10 years ago. Some of us have known what’s coming and we’ve been preparing. On my property on Norfolk Island, here in Australia, I have a fresh water creek that circles it, you could say horseshoes it, so I have a source of fresh running water. It’s a small farm with an established orchard. Yes, we need to grow our own food. It’s about reconnecting with the land. HR: Yes. There’s a wonderful book that’s come out, that I’ve been reading. I think this guy might just be my soulmate. He’s Irish and his book is called, The Moneyless Man: A Year of Freeconomic Living, by Mark Boyle. As an experiment, he decided to live for a year without any money whatsoever. He’s now done it for two years. I don’t know that they’ll ever print this book in America. All his proceeds go to charity. This is my kind of a man. So, what is coming up for your future? HR: I’m very busy with my hypnotherapy practice and my talks, and I’m involved with a lot of things. So, my life is actually busier. I can’t believe it. I thought I was retiring. I’m just not singing anymore, that’s all. I don’t seem to be retired. I’m not out to pasture. If you could say something to all your fellow human beings across the planet, what would be your message? HR: Love. That’s all. Because love ultimately is all there is, and if you have love in your heart and kindness in your character, you’re going to be okay. For more information, please visit HelenReddy.com. Fabulous article! Thank you so very much! She covers a lot of territory in this. Good stuff!